Review of: Play Dragon Maiden Slot Online by Play'n GO at Slotorama! The legend of the Dragon Maiden comes alive in this exciting 243 ways slot from Play'n GO! Lady Geneth has the power to control the Dragon and unleash flame and fortune in this powerful new slot. The Dragon Maiden is on hand to help you connect winning combinations by randomly turning into a wild, with the possibility of expanding up to 3 symbols high! 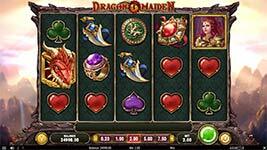 The legend of the Dragon Maiden comes alive in this exciting 243 ways slot from Play’n GO! Lady Geneth has the power to control the Dragon and unleash flame and fortune in this powerful new slot. The Dragon Maiden is on hand to help you connect winning combinations by randomly turning into a wild, with the possibility of expanding up to 3 symbols high! If you can trap 2 Dragon scatters on any reels, those reels will freeze, and you’ll get re-spins until no more symbols appear. If your re-spins leave you with 3 or more Dragons, then you’ll enter Free Spin mode and the Dragon it will trigger reel expansions (one symbol at a time) until it gets to a towering 6 symbols high. Once a reel has reached maximum height it will reward you with a Golden Free Spin, golden free spins are played on a 5×6 reel increasing your pay ways to 7,776! Play Golden Free Spins while the Red Dragon unleashes fire and fury around you, have you got the nerve to chase its treasure? Do you have what it takes to help the Dragon Maiden command subdue the fearsome beast and reveal its treasure? It’s time to find out. Wild Symbol – Embrace the Flames of Fortune when the Dragon Maiden turns wild. Dragon Maiden symbols can become wild with the chance to expand up to 3 symbols high. Dragon Scatters – Can you capture the Dragon’s Fury. Ferocious Dragon scatters award re-spins and free spins. Free Spins – Feel the Power of the Dragon! Dragon scatters increase the height of the reel they land on, up to 6 symbols high. Golden Free Spins – Unleash the Fire of the Dragon. 7776 wasy to win on huge 6 symbol high reels.